25 UDC Accomplishments - Upper Delaware Council, Inc. Serving for 30 years as the nucleus of a rarely legislated local-state-federal partnership management model for the Upper Delaware Scenic and Recreational River in New York and Pennsylvania, and providing the mechanism for UDC representatives, citizens, municipal leaders, and business interests to seek direct responses from state, federal, and river basin agencies involved in the river’s management. Gaining federal protections for the river while guarding against any excessive land takeover by limiting the National Park Service to acquiring 124 acres on a willing seller basis, unlike in a traditional national park. No land in the river corridor has ever been condemned through eminent domain. 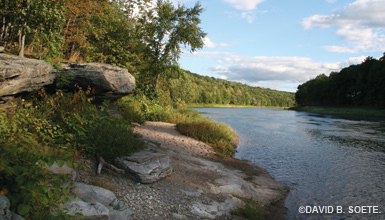 Local land use controls are retained in recognition that our property owners and communities are the best stewards of the river flowing through our region. Performing substantial conformance reviews, providing technical assistance, and issuing comment letters on members’ zoning ordinances, amendments, significant projects, and proposed development plans by any party that would affect the river corridor to facilitate optimum adherence to the objectives of the Land and Water Use Guidelines and the goals of the River Management Plan. Awarding a cumulative $720,397 in competitive Technical Assistance Grants to participating members from 1988-2013 to help subsidize 210 non-construction projects. See the impressive list of projects. 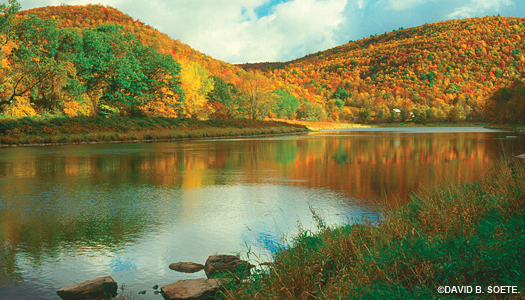 Publishing since 1988 “The Upper Delaware” newsletter about the environment and people of the Upper Delaware River Valley, currently available bi-annually in print to nearly 9,500 subscribers and on-line in full color. Hosting a groundbreaking Mar. 18, 1989 symposium on the “Upper Delaware River’s Recreational Future” in Matamoras, PA which discussed management techniques to improve such issues as litter, trespass, human waste, visitor conflicts, alcohol abuse, water pollution, overfishing, wildlife disturbance, and lack of adequate facilities that had compelled the original call for federal assistance in protecting the special river. Stopping the construction of three hydropower dams on Shohola Creek that would have damaged state game lands and a bald eagle hacking area; and opposing wastewater discharges from the Rosencrance Landfill in Beach Lake, PA that led to the proposal being withdrawn early in the permitting process. Creating a unique “Certificate of Compatibility” program in 1989 that provided an enforceable agreement directly between property owners from towns and townships that weren’t yet UDC members and the National Park Service, assuring that they would never be forced to sell their land to the federal government as long as it was voluntarily managed in accordance with the River Management Plan’s guidelines. Sponsoring the forum, “The Delaware River: Flowing to the Future” from Nov. 12-14, 1989 in Matamoras, PA that attracted 125 guests, for which published proceedings remain available. Former U.S. Secretary of the Interior Stewart Udall was a keynote speaker. Panel discussions included: River Recreation; Supply, Storage & Hydropower; Predicting and Governing River Flows; and The Future of the River. Publishing, updating, and distributing 174,600 copies to date of a “Visitor Information Map & Guide for Touring the Upper Delaware Scenic and Recreational River: NY and PA” since 1989. Other UDC publications include a “Design Handbook for the Upper Delaware Scenic and Recreational River” from 1990; UDC Annual Reports; and Local Officials Directories for the river valley communities. Partially funding and participating in a Time-of-Travel Dispersion Rate Study coordinated by the Delaware River Basin Commission in 1991 to help predict the movement of river pollution flows in the event of a toxic spill. Leading the campaign to elevate the priority and secure $4 million in funding to replace the Lordville-Equinunk Bridge after it was closed to traffic in Feb. 1984 due to a failing abutment, demolished in Nov. 1986, and subject to detours until construction on a new bridge finally began in 1991 and opened in 1992. Analyzing the transportation of hazardous materials for the creation of a watershed risk assessment in 1991, and later working with Conrail and the Delaware Riverkeeper Network to compile a 1997 “Emergency Response Guide for Local Officials” outlining procedures for railroad mishaps which was supplemented by local responder training exercises and drills along the train tracks in Deposit, Lackawaxen, and Sparrowbush, and arranging meetings with subsequent railroad owner Norfolk Southern Corp. and operator Central New York Railroad. Sponsoring public forums and workshops throughout the region, including “Delaware River Headwaters: Water for Millions” 10/29-30/90; “Tourism as an Economic Development Tool in the Upper Delaware River Basin”, 4/7/92; “Regional Ecotourism”, 12/7/94; “Upper Delaware Fisheries Conference”, 4/20/96; “Eel Weirs Forum”, 4/14/99; “Siting Cell Towers in the Upper Delaware Scenic and Recreational River Corridor”, 7/9/01; “Battling the Hemlock Woolly Adelgid”, 11/5/03; “Land and Water Use Guidelines Workshop”, 3/26/08; and “Working with the River Management Plan”, 3/24/12. Organizing a “Friends of the Upper Delaware” group from 1992-1996 in which citizen volunteers participated in Adopt-a-Highway, Adopt-a-Stream, and GreenWatch programs; water quality monitoring; and an award-winning “I Walked the Upper Delaware” tour series, among other activities. Educating foreign delegations from the Vodlozero National Park in Russia on July 31, 1992 and from the Sichuan Province of China on Oct. 25, 2000 about the Upper Delaware region during their fact-gathering visits; as well as co-hosting U.S. National Park Service Director Fran Mainella on river and land on July 23-24, 2005; and meeting Pennsylvania Governor Tom Corbett during his Upper Delaware River kayak trip on Aug. 23, 2012. Undertaking a Toxics Identification and Control Campaign that resulted in a 300-page report released in 1995 that took the UDC three years to complete and was funded by a $20,000 J.M. Kaplan Fund grant to locate existing and potential toxic sites in the Upper Delaware watershed and advocate for their clean-up. Convincing the National Park Service to tailor its reporting requirements for Upper Delaware businesses based on their objections to the switchover in 1995-96 from Commercial Use Licenses to Incidental Business Permits after appealing to Congressional representatives and Department of the Interior officials in Washington. Prevailing upon the City of New York to install a new release valve system for the Cannonsville Reservoir in 1997 and adopting a “Position Paper on Flows” on Feb. 5, 1998 offering 14 recommendations advocating for the optimal balance of flows and releases from the Delaware River Basin Reservoirs to meet the diverse needs of river users and the aquatic community, while closely reviewing throughout the years Flexible Flow Management Program variables, flood response and mitigation strategies, fisheries plans, and making requests for emergency thermal stress relief. Joining the grassroots committee that succeeded in drafting a corridor management plan to nominate the majority of New York State Route 97 for designation as the Upper Delaware Scenic Byway through legislation approved by Gov. Pataki on Aug. 6, 2002 and working closely with the non-profit organization in the ensuing years on enhancement projects for this major transportation artery through the river valley. Opposing the $1.62 billion New York Regional Interconnect, Inc. (NYRI) proposal, first raised in October 2003 by Canadian firm Pegasus Power Systems and officially dismissed by the Public Service Commission on April 21, 2009, to site a High-Voltage, Direct Current power line that would transmit electricity largely over railroad rights-of-way 190 miles from Marcy to Rock Tavern, with a unifying battle fought on the local, state, and national level in which the UDC testified in Washington and Albany, was awarded a $50,000 grant from Senator Bonacic to study NYRI impacts, participated in Communities Against Regional Interconnect meetings, and approved resolutions against NYRI and the U.S. Department of Energy’s proposed Mid-Atlantic National Interest Electric Corridor that was also ultimately withdrawn. Being tapped by New York State Senator John J. Bonacic to administer a cumulative $390,000 in legislative member item initiatives from Fiscal Year 2000 to 2010 for projects by the UDC’s eight NY member towns to increase river access and improve town facilities; and successfully nominating the Upper Delaware River segment of Pike County for March 2003 inclusion on the Pennsylvania Rivers Conservation Registry to enable priority grant funding for Shohola, Lackawaxen, and Westfall Townships. Hosting with the National Park Service a Natural Gas Public Informational Forum attended by approximately 700 people on May 21, 2008; continuously reviewing and commenting on draft regulations, amendments, and relevant policies by the Delaware River Basin Commission, New York State, and the Commonwealth of Pennsylvania pertaining to natural gas in the Marcellus Shale region; and consistently urging regulatory authorities to prohibit any siting of well pads or ancillary facilities associated with the high impact industrial activity within the designated river corridor boundary as an incompatible use. Sponsoring an annual awards ceremony to bring public recognition to individuals, groups, communities, and agencies that have worked to enhance the river valley or protect its resources; and hosting an annual family raft trip to encourage direct interaction with the river.